Think this card is perfect for someone in the coming future? Right card, wrong time? By picking "Choose a Future Delivery Date" you can specify the date you need it by and we'll get it to that person on the week of the date selected. Domestic (USA) orders are shipped a week before the chosen date. International (outside USA) orders are shipped a month before the chosen date. You'll get an email once it's shipped. Have really bad handwriting? Dog ate all your pens and pencils? We got you. We'll use our blood as ink to create an authentic experience. Jk we'll break out the feather and ink just for you. Background: When's the last time you sent a postcard? Have you sent another one right after that? And then another one? Get ready to troll your friends in the best way possible. Let them know you're thinking of them, and then let them open their mailbox to find yet another DAY AFTER DAY for 4 days. It's recommended you send the first card, and then wait a couple of days to let it sink in, and then send the second, then the third, and finally the fourth. DJ Khaled, the self-proclaimed "BEST" at everything, has put together some of the biggest hip hop collaborations of all time. Songs such as "We Takin' Over" and "All I Do Is Win" have grown to become the beloved anthems of champions. 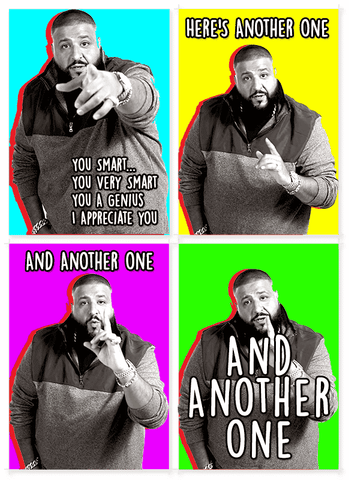 And while the songs bear DJ Khaled's name, he doesn't really rap on them, but instead blesses us with his famous catchphrases such as "WE THE BEST" and of course "ANOTHER ONE" to let you know he has another hit single on his hands. In 2015, DJ Khaled stepped his game up, releasing everyday tips and advice via SnapChat titled "Keys to Success." On November 26, 2015, Music Choice released a motivational video featuring DJ Khaled and his compilation of motivation to help you win at life. First they will appreciate you, and then they will hate you, and then you will WIN. Because of course, it's DJ Khaled and all he does is WIN.